Tivo told me to watch this gymnastics movie called 'Stick It'... and i actually like it. *gasp* i generally hate girly movies, but this is pretty good... and the tricks are freaking awesome! if you like 'Bring It On' (shockingly, one of my favorite movies) give this one a try. 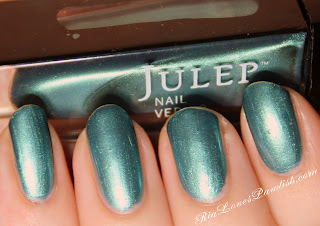 today we're back with Julep Megan. out of all the shades i bought, this is definitely the most me. it's similar (but not a dupe) to loads of polishes i already own, it's definitely something i would have picked out at the store. Megan is not going to be for everyone as it is quite frosty... and wanted to bubble on me. the color, however, is gorg. it's a light tealy blue (which can look much green toned than the swatchie in certain lighting) that makes me think of the Caribbean... not that i've ever been there! from different angles the color looks darker and lighter... i love it. if you're going to buy one frost this year, i recommend this one! i used two coats to even out all of the patchiness. i think it wouldn't have bubbled as badly if my hands hadn't been shaky yesterday... no idea what was up with that. you can see a bit of bubbling in the swatchie, sorries!! one coat Seche Base, two coats Megan, one coat Seche Vite.